To Estonia today for the tale of a Baltic German gentleman of learning whose professional fascination with electricity proved to be the death of him. Georg Wilhelm Richmann was a pioneering physicist who conducted experiments on natural electricity and, as you can probably guess, met a sticky end thanks to it! One summer day, Richmann was involved in a meeting at the Imperial Academy of Sciences and Arts in St Petersburg when he heard the sound of distant thunder. At his home he had a device named an electrical gnomon, with which he measured the strength of atmospheric electricity and in every storm he made and recorded readings using this item. Keen to employ the device in this particular storm he excused himself and rushed home to begin his experiments. 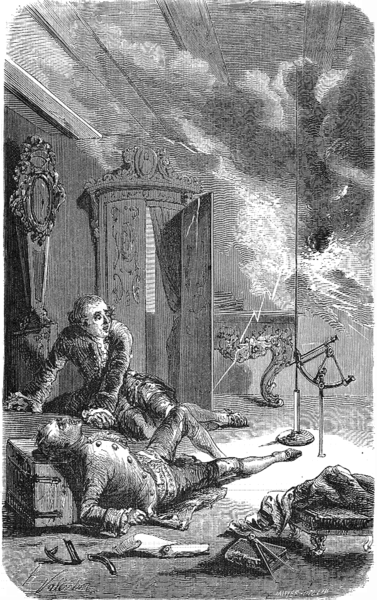 Whilst closely examining an electroscope, a bolt of ball lightning struck the device and travelled straight into the physicist's head. The electricity rushed through Richmann and left via his foot, blowing a hole in his shoe and sending him flying across the room. The gnomon was destroyed and the physicist was killed instantly, the first scientist to die whilst experimenting with electricity.